SarahViz.com: Boston Sailing Cruise - DISCOUNT CODE FOR TICKETS! Boston Sailing Cruise - DISCOUNT CODE FOR TICKETS! So...school is almost out here in New England. Holy crap, right?! Usually, summertime in the Trenches is all about baseball for Eldest, with a few family vacays (Myrtle Beach and Cape Cod) thrown in. We had been tiring of the hectic baseball summers and the up-in-the-airness of the All-Star schedule. So we made the tough decision to pull the plug on our Cape Cod vacation after 7 straight years. There were lots of tears. And it was a good thing we didn't schedule anything. Because guess who else made All-Stars this year? So Eldest is on the U11 team (with Hubby coaching) and Middle is on the U9 team. Which means that we'll be in two different places for the months of June and July. Swell. That's where fun family day trips are going to be KEY for us! And since we are only a short drive from Boston, enter Boston-Sailing. "Dedicated to providing the most impeccably luxurious and hospitable sailing experience in Boston, we here at Classic Harbor Line are looking forward to the privilege of escorting you on a breathtaking excursion aboard the most elegant sailing vessel in Boston Harbor: Schooner Adirondack III. Boston’s rich maritime history is best viewed from the water, so why not do it in style? While out on the water on Bostons best boat tour, you will be treated to skyline view and Boston Harbor that cannot be captured any other way. This is the best way to go sightseeing in Boston! So come on out, kick up your feet, and let the Classic Harbor Line crew do all the heavy lifting (and drink pouring) for you. Sailing on the Adirondack III with us will provide a new perspective on the city of Boston for the first time visitor and the seasoned local alike! 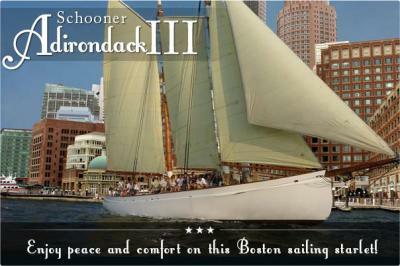 Whether buying tickets for one of our Boston Day Sails, Sunset Sails, City Lights Sails, or privately chartering the schooner for a special family or corporate event, you will be amazed by the comfort and beauty of Adirondack III. Like all of Classic Harbor Line’s fleet, the unmatched Adirondack III was built and is maintained by the Scarano Boat Building Company in Albany, NY." Lucky for you, my readers will receive $10 OFF each ticket purchased at Boston-Sailing using the online promo code FAMILY10. Ahoy, mateys! See you at the ballfield on the high seas! *Disclaimer: I was offered complimentary tickets for my family aboard the Adirondack III in exchange for this post.